How do artists express emotions when these feelings are non-visual? using imagery that matches the essential constructs of a predetermined analogue of an emotion. Let me begin with the first approach where an image is reconfigured (i.e. 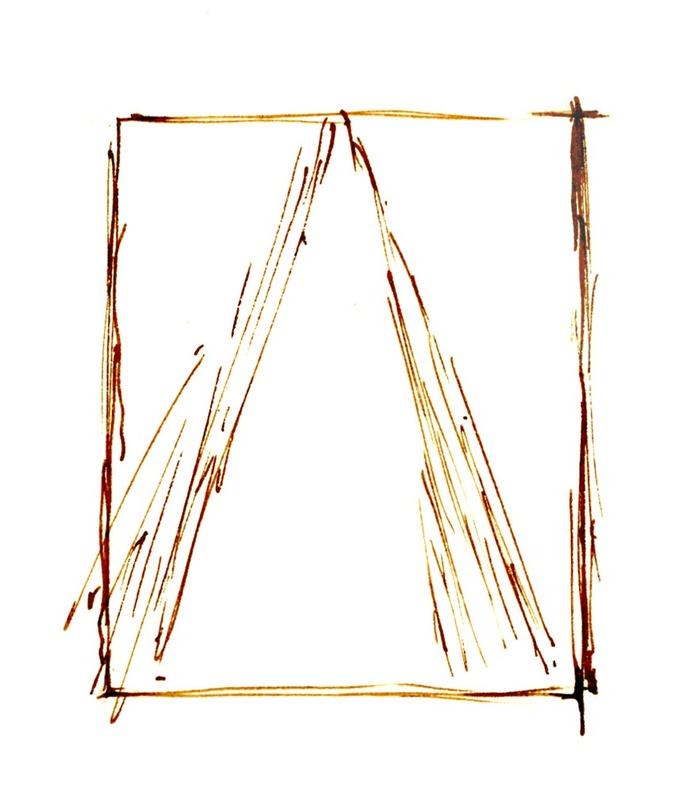 warped) to resemble an analogue drawn as a reflexive response (i.e. an instinictive automatic response) to an experience. 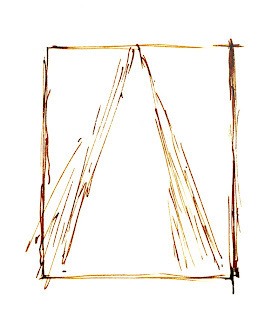 If an artist were to conceive that the feeling of depression is like a v-shape (see diagram below)—mindful that not all artists would necessarily see this dreadful mental state in such a simplistic structure—then this schematic arrangement of converging lines descending to a low point would be the compositional arrangement that the chosen image would be configured to replicate. Of course the degree of the distortion of the original image is the variable where artistic sensitivities play a role in what otherwise would be a simple game of anamorphic distortion. 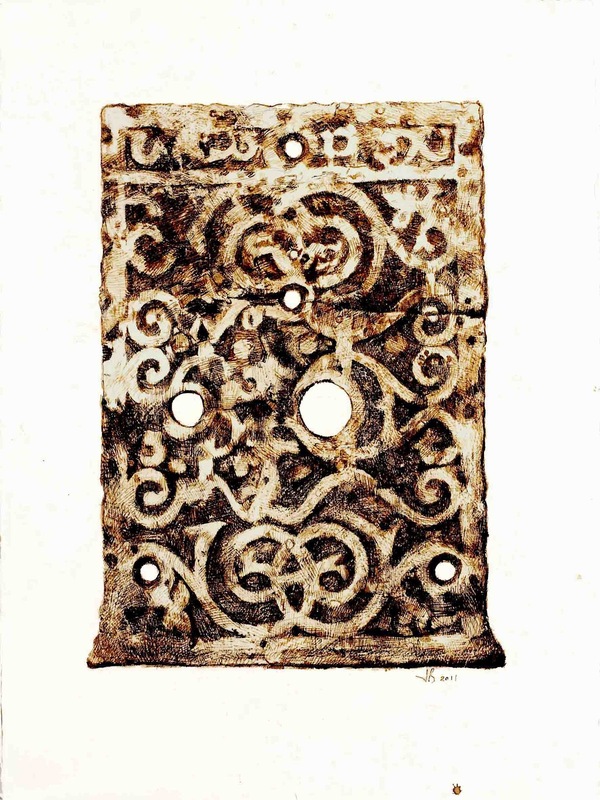 In my drawing of a very corroded lock plate—a relic found in an architectural excavation by the Archaeology Department at James Cook University—I have digitally manipulated the original drawing (shown below) through three stages of reconfiguration to demonstrate the process and outcomes. Of course, the “success’’ of communicating a state of depression from these adjustments can only be determined by each viewer’s reading and there are far too many variables to ever be certain that meaning can ever be express clearly. For instance, not all viewers will sense that depression is a downward flow. Moreover, some will not have the “right” mindset to wish to negotiate any meanings let alone depression and some may never have experienced the feeling at all to be able to pass judgement. If I may stretch this point even further into territory that I fear the most: some viewers may not have been acculturated to looking at art to know what they are looking at and have the skills to negotiate any meaning. I am selling this drawing for $850 AUD including postage and handling to anywhere in the world. Please contact me using the email link at the top of the page if you are interested. 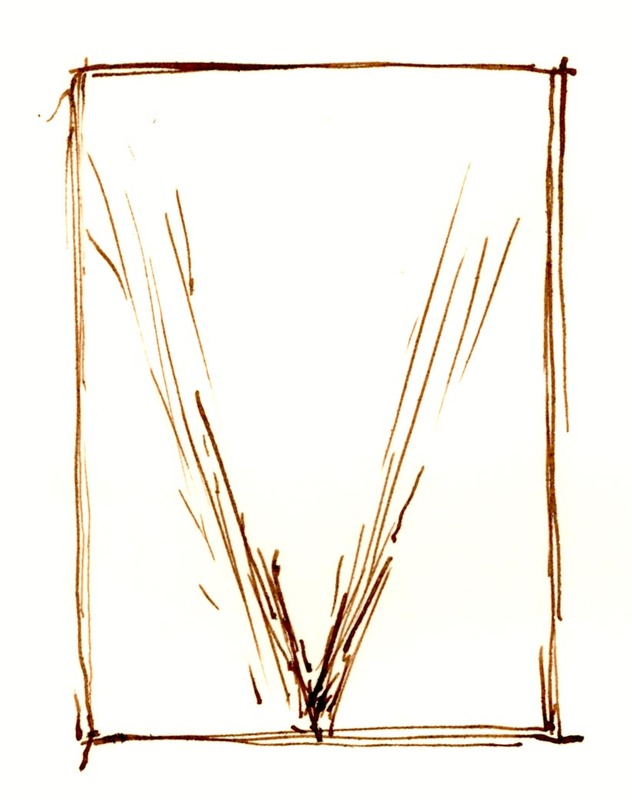 As a corollary to the analogue structure of depression I have reconfigured the original drawing to match an inverted v-shape compositional structure (see diagram below) envisaged to be the complementary emotion to depression: joy. In the three drawings shown further below, hopefully the different degrees of skewing the original drawing to match the inverted v-shape expresses in each of the three consecutive stages of distortion a heightening of this uplifting feeling. 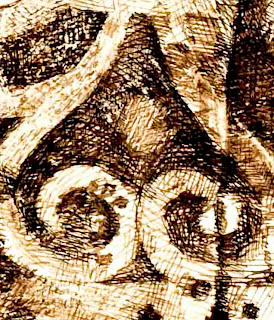 In the three-stage superimposition of the analogue of joy (the inverted v-shaped pattern) shown below, the upper image blends into the original drawing to some extent by virtue of the colour of the analogue. In the lower two images the analogue is softened so that the pattern is barely discernable. For the third and final approach to using an analogue as a compositional structure, the subject itself is explored until certain arrangements of its features are found that resemble the analogue pattern. As an example of this approach a small section of the original drawing of the door plate has been extracted (see image below) that has the same the essential upward converging lines in its compositional structure as those in the inverted v-shaped analogue of joy. By intention this small section as an artwork on its own will embody and project the feeling of joyful elation. Of course this image is simply a cropped part of the larger image and to truly communicate the feeling of joy then a plethora of other visual devices will need to be brought into play to assist in the projection of meaning. 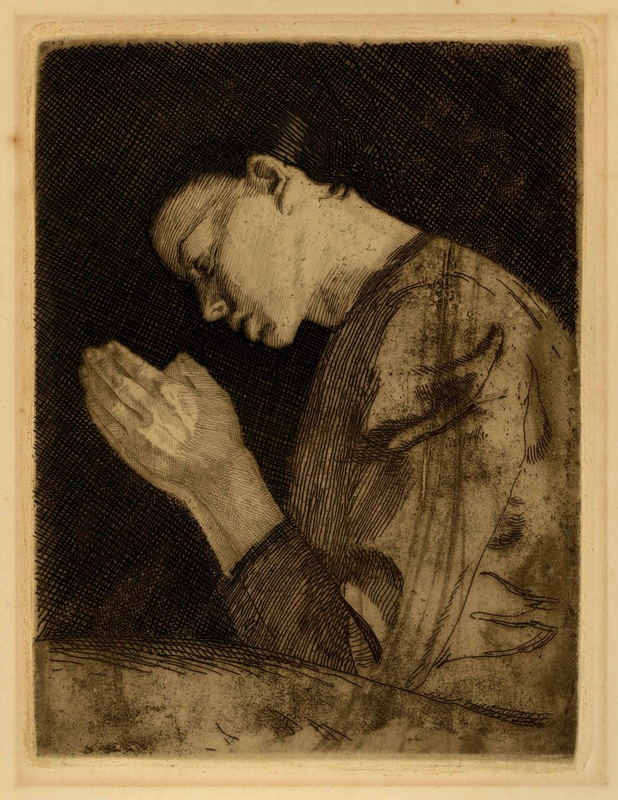 A prime example of how an artist uses other devices to supplement a fundamental analogue structure is Kathe Kollwitz’s very beautiful and emotionally resonant etching Betendes Madchen [Woman Praying] (shown below). Here the underpinning compositional structure fits broadly with the first v-shaped analogue discussed above that arguably projects a sombre mood. In addition to this structure, however, the contrast of a mechanical style of cross-hatching, raised in strong relief by the intaglio process rendering the background, juxtaposed beside the delicate lines portraying the woman’s hands and face presents the praying figure as spiritually removed from the temporal world. Interestingly, this print also features lightly inscribed lines laid over the rendering of the figure’s torso. These loosely-made gestural lines may be viewed as the equivalent of the second approach of superimposing an analogue pattern on an image. Condition: very strong impression in excellent condition. There is a tiny fox mark on the upper left edge and faint toning from the print having been mounted. 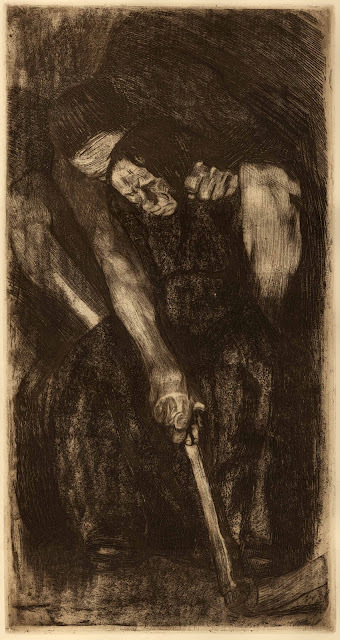 Perhaps an even more powerful image by Kollwitz and one in which the subject is clearly modelled on an analogue structure is the very large etching, Inspiration (shown below). In this image, an elderly woman seen with her back nestled into a crouching man has the man’s arm stretched across her front in a protective way by virtue of the implement he grasps—a hoe? The angle of his protective arm and its grasped implement, when seen in combination with the angles of his legs, create downward converging wedge-shaped arrangement expressing a heavy mood. Such a reading rests not only on the directional thrust of this wedge shape. 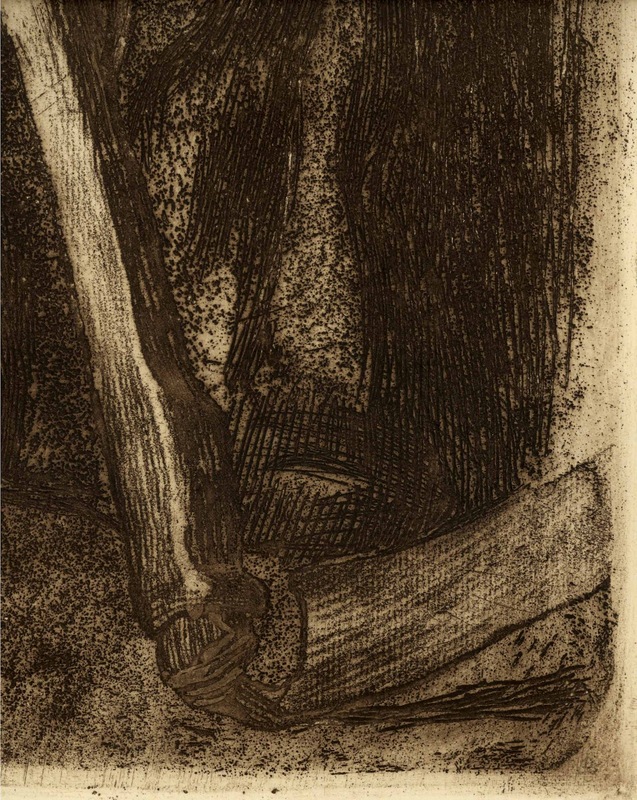 The point where the critical lines converge—the tool head of the implement—is the punctum point (see the earlier post “Dujardin & Dietricy: Punctum”) that projects the layering of implicit symbolic meanings of this point: rural life, hard labour, grim determination and, with insight into Kollwitz’s other prints, revolt and war. Originally created for The Peasants' War, but ultimately not included in the cycle. Condition: very strong impression in excellent condition. 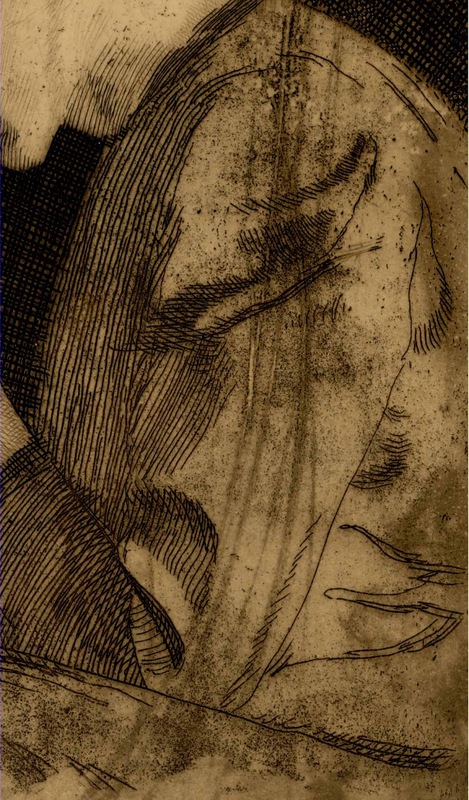 Kollwitz’s prints are so rich in visual devices designed to express meaning that this discussion could be ongoing. 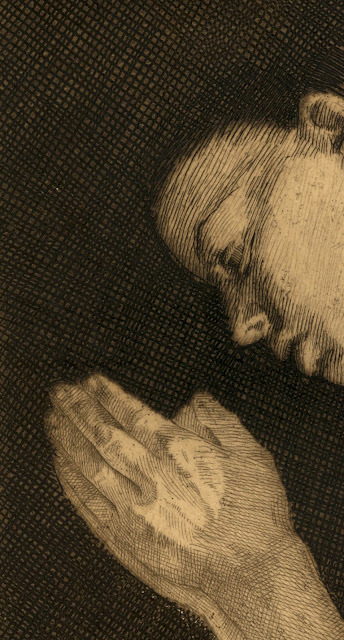 Nevertheless, there is one print that should not be ignored when looking at ways of using analogues of emotions: Woman with Folded Hands (shown below). Condition: very strong and crisp impression. There are two moisture stains well away from the image and a roughen strip in the paper, again well away from the image, at the top of the margin from a previous mounting. I am selling this print for $900 AUD including postage and handling to anywhere in the world. Be aware that as this item is large it will be rolled and posted in a cylinder. Please contact me using the email link at the top of the page if you are interested. This image, with its centrally placed figure dramatically lit with chiaroscuro lighting, is a fine example of how to use a flow of emotionally charged lines that may be read as analogues generated by deep emotion. These lines seen as a downward curving flow from the upper right edge of the image down the shadow side of the figure (see these lines in the details below) to my eyes show a dark concern weighing down on this pregnant woman—or a woman that I assume is pregnant based on the way that her left hand gentle rests on her belly. 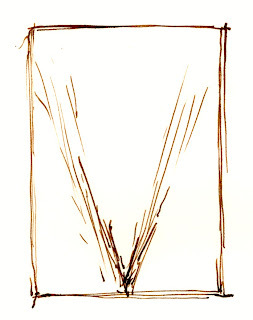 With regard to the above three approaches to using analogues, this treatment falls into the approach of superimposition of analogue patterns where the graphic space of the analogue marks are integrated with the pictorial space of the portrayed women (see the earlier post “Haden & Brangwyn: Graphic & Pictorial Space” concerning these two spaces). For an excellent explanation of analogues I recommend looking at Betty Edwards’ Drawing on the Artist Within.